So this happened last year - a solar-powered dirigible was tediously done by a bunch of dozen folks. I came through a trail of reading on solar energy, that started with a presentation by Elon Musk introducing the Tesla Solar, which seems a half-baked plan in its early days (more technology into a rather simple existing solution means more points of failure, and hence more frustration with things over longer period of time, plus the need for greater expertise if something goes wrong). It now itches to build a small floating solar-powered dirigible of my own. Frustrating, because what is sold as "kids' toys" is still exciting new discovery about the world in my interactive-reactive head. It will lead to failures in other points of my existence chain, which might be perceived as more serious, or be seen as foretelling of a career cascade (if that's not what mine already qualifies for) and hence another thing to cope with. But that thought aside, plans are already underway to visit the supermarket to get a new stash of bin bags. It will take taping together half a dozen of those, by my intuitive calculation (to be confirmed on paper later). 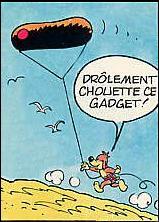 Ideal would be to try replicate a "Pif", a french solar (or rather, hot-air-powered) dirigible akin to a kite maneuvered with both ends tied and connecting to a string connected to a spool that a lucky kid from a village will get to hold (of course, i do the maneuvering). This would work best in the hills, which is coincidentally where I am. Imagine meself on a lovely morning atop a local summit doing this.